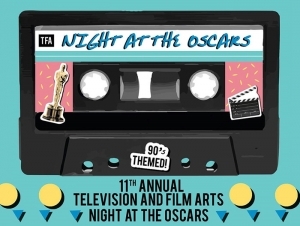 Students and community guests can feel like stars on the red carpet during Buffalo State's 11th annual Television and Film Arts (TFA) Night at the Oscars party on Sunday, March 4, from 8:00 p.m. to midnight in the Campbell Student Union Social Hall. Students in TFA Director Jeffery Hirschberg’s Film and Criticism classes organized the event, which includes a live viewing of the Academy Awards ceremony on a big screen. They will conduct red-carpet interviews and take photos of guests. Music will be provided by the Good Neighbors and complimentary refreshments will be served. The theme for this year's Oscars party is the 1990s, which pays tribute to the 90th anniversary of the Academy Awards. In keeping with the theme, first-year student coordinators Heidi Keller and Mikayla Kempsi will decorate the Social Hall with ’90s decor and set up photo booths. Although guests do not have to dress in ’90s attire, there is a semi-formal dress code, event co-chair Brayton Lydell noted. “Choosing this theme was easy because the ’90s is a decade that meant a lot to people our age,” Lydell said. During the evening, TFA students will honor women in film who hold high positions, including Rachel Morrison, the first woman nominated for cinematography in the 90-year history of the Academy Awards. The TFA event also enables aspiring filmmakers to present their hard work for Pioneers Awards. A group of 23 students submitted short films in hopes of receiving best of awards in the categories of picture, writer, director, actress, and actor based on the votes of TFA alumni. All of the nominees can be viewed prior to the event at tfaoscars.weebly.com. The TFA planners also will award a “best dressed” award to one of the guests. Tickets are $10 for the general public. Admission is free admission for students with ID. All proceeds benefit the TFA program.